One of the most unique horror films in years, and a true visual treat. Horror films and I have always had a turbulent relationship. In principle, horror is probably my favorite genre. Whether the source of horror in a story be the powers of Hell, the mind of a madman, or something inexplicable, there's just something fascinating about watching people face what they can't understand and can't stop. Horror is one of the oldest genres around, being comprised of many a folktale, legend, and religious parable. Hollywood has long since forgotten horror's roots in legends, and for the past few decades has produced slasher films and serial killer stories to the exclusion of most other forms of horror. I've become so sick of seeing girls chased by faceless men with knives or claws or piano wire that I'd almost given up on the genre. What a relief it was to hear last month that Viz had acquired the rights to the Japanese horror film Uzumaki (Spiral), based on the manga currently being serialized in Pulp. Translating that truly bizarre collection of literally twisted tales into a coherent film would be no small task, but if they could pull it off, greatness could result. When the film screened at the American Cinematheque's Japanese avant-garde film series in Hollywood, I had to check it out. For those who haven't read Junji Ito's Uzumaki manga (and if you haven't, you're missing out on one of the best manga currently on the market), it's basically an anthology of "Tales from the Crypt" style descents into doom, only each episode takes place in the same town with a loose linear chronology, and each person's death or disfigurement is tied to a spiral. The story is sort of narrated by the attractive young high school student Kirie, whose boyfriend Shuichi's father is the first to feel the effects of the Spiral. Kirie watches with growing concern as the formerly normal salary man goes from just collecting things with spirals, to videotaping spirals, to eating spirals, to finally discovering that the spiral lies within. From there, the story gets even more bizarre. While the manga handled each person's tale one at a time, the film interlaces them in such a way that we can see that the effects of the Spiral are effecting the whole town at once with increasing power. In the end, all stories climax at the same time in the third act, a short montage of news footage and photographs. The manga continues the story beyond what the movie covers, but until Viz finishes translating it, I don't know where it leads. By this point, if you haven't read the Uzumaki manga, you're probably wondering what the Hell the Spiral is. Well, it's different things to different people. For Shuichi's father, it's an abstract idea of perfection that leads to nirvana. For his wife, it's the ultimate evil that needs to be wiped out at all costs- even if that means cutting off her fingertips and purging her body of all other spirals. For one student, the spiral brings focus on to one point and is the surest way to be the center of attention. For another, the spiral is a spring that can bring attention through surprise. How the Spiral manifests itself in these and other people is half the fun of this film, so I don't dare to go into any more detail. 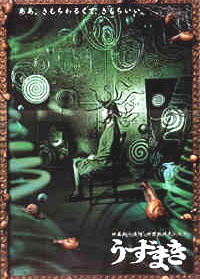 The spiral also works itself into the visual design of the film. The clouds churn into spirals. The water in a pond swirls like a spiral. When a man dies in a car accident, he cracks the windshield of his car into a perfect spiral. Throughout the film, little spots in the background begin to swirl and follow Kirie. The film even spirals in on itself, with the opening lines becoming the ending. While the film contains plenty of gore, some amazing special effects, and great lead performances, it does stem from the Japanese school of campy horror films, and that might throw off some American viewers. The soundtrack starts off like a low-budget high school drama with music that wouldn't be out of place in a circus. Some of the supporting performance, like the Jack-in-the-box kid and the hair girl are over-the-top to the point of parody. While American moviegoers might not be used to seeing silly performances and wacky music in a serious films, it's really not much different from anime where you get moments of slapstick comedy in serious dramas or violent horror. Somehow, American filmmakers can almost never pull this off, but here the director somehow strikes a balance that avoids silliness. Because it's foreign, a genre film, and not an "artsy" film, Uzumaki will likely have a hard time making it into many theaters around the country, but when it comes out in video some time next year, I strongly recommend that fans of horror, fantasy, and the bizarre make an effort to watch it. It's a horror film that leaves you feeling uneasy from start to finish, and doesn't rely on cheap scares and fast editing to put you on edge. If more horror films showed this level of imagination, perhaps the genre would earn back the respect that it's lost in recent years. Uzumaki certainly restored my faith.